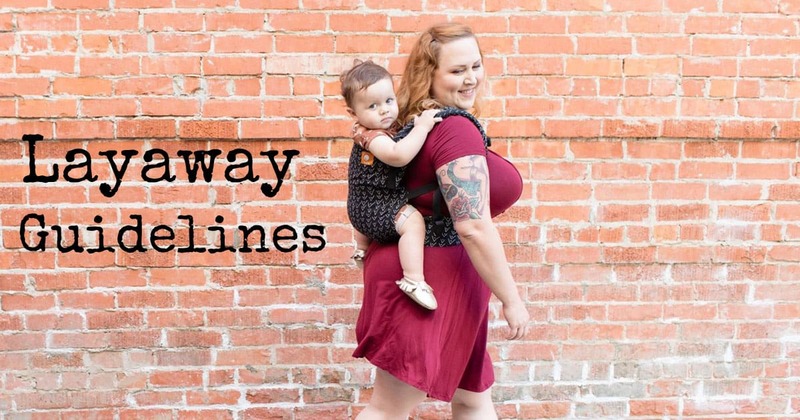 We know that some of our baby carriers are a big investment! We think the investment is more than worthwhile, which is why we offer our Layaway Plan! We offer Layaway on items over $90 and also on select lower-priced products (due to popular demand). If you would like layaway for another item, please contact us and we may be able to make it happen! A $30-$50 deposit (varies per item) is required to hold the item of your choice and ensure that the color/size that you choose is laid away for you! To place your Layaway order, choose the “Pay Deposit” option at checkout when you making the purchase. Proceed through checkout and pay the deposit with Paypal or your credit card. Please note that we cannot accept checks for Layaway deposits and that this option will not be presented at checkout if you have a Layaway item in your cart. When we receive your order, we will send you a Paypal invoice for the remaining amount, due within 90 days of your order. Please save the invoice until your layaway is paid off. Make payments on your layaway at your own pace by going through the links on the invoice. You can pay the invoice with a debit/credit card or Paypal. You do not need to have a Paypal account to pay through the invoice. If you prefer to pay off your remaining layaway in one payment, you may also contact us and we can invoice you for the remainder of the layaway, which you can then pay through our cart. Layaway payments must be completed in full within 90 days. You may pay on the schedule of your choice, as long as payments are completed within 90 days. If payment in full is not received at this time or if you cancel your layaway, the carrier will be released into general inventory and your payments will be refunded, minus a 20% restocking fee. To be clear, this is 20% of the full purchase price, not 20% of the amount put down. Should you decide to cancel your layaway, please be aware that if it has been more than 60 days from the date of a payment, payment can only be refunded via check or by sending you money through PayPal. We do not cover the fees that PayPal charges for this service. If you change your mind about the color/style of the carrier, you may make one change to the layaway. After that, we charge a 10% restocking fee for additional changes. If you need to make any changes to your order, including address changes, please send us a separate email indicating what is needed. Please do not leave important information to be read in the message box of your payment, as it may be missed. We will mail the carrier the next business day after your order is paid in full! We hope that you find our Layaway plan helpful – we have made every effort to keep it fair to us and to you. If you have concerns, please don’t hesitate to contact us! **Tula Blankets will have a deposit of $20, instead of $50. The cart will also charge a shipping charge at checkout. Shipping on the blankets is actually free and this amount will be taken into account on the final invoice. Apologies in advance for any confusion.